Agents of the New Order are exceptionally good at getting Code violators to admit their crimes. It's not always challenging, though. Orca pilot Vazqez McLoud wasted no time in confessing his guilt. The miner belonged to Clondike -entertainment and digging corp. When he met our Agent, Vazqez was less focused on entertainment than digging--a word Russian EVE players commonly use when referring to mining. Agent Fate and Destiny planned to spend the day shooting some barges and exhumers; she didn't bring any Orca-removal equipment. So she did the next best thing and deleted the miner's drones. Vazqez insisted that his mining operation was an emergency. He desperately needed to continue. But unless he got a permit, mining in highsec was completely out of the question. The miner sent mixed signals. Something was getting lost in translation. Watch this guy complain that "Nobody ever told me about the Code!" the next time he loses a mining ship. Without his drones, Vazqez's Orca was a billion isk paperweight. The greedy miner floated in space, hoping for a solution that didn't involve opening his wallet. Are mining permits a real thing? 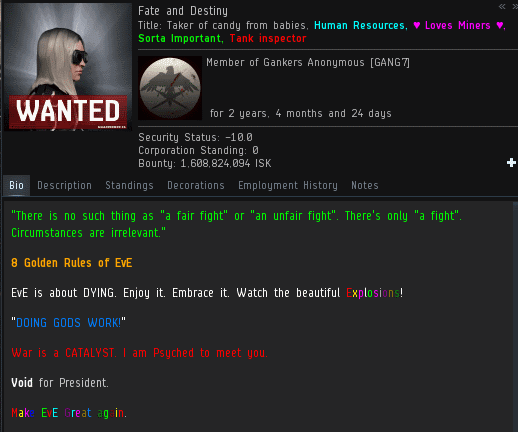 Agent Fate offered her credentials. Vazqez had a strict policy against negotiating with terrorists. He felt he was honour bound to spend the day sitting in a neutered Orca. Of course, Agent Fate had more important things to do than babysit a droneless Orca. While Vazqez stubbornly awaited some kind of credit for his lost drones, Fate moved on and continued to help save highsec. I leave it to the reader to decide who made better use of their time. Make the verge vendor great again! Plot twist - will he get to see the grandkids?! Speaking of drones, i noticed that griffins and ecm drones have had a sharp increase in cost. Ag will have to overheat their sebos when scooping blue wrecks to compensate. Smart miners move to Null or get a permit. Always! Marketing has changed. You do not blindly drill for oil if you don’t know its there anymore. The same way businesses now target their customers before engaging eliminating those who do not require their services and business SMS is one way they have been able to do that.